I had just returned from Québec City and was on the hunt for a seat outside, a glass of wine and a wifi connection. It had been several days with no internet and I was having withdrawals (and I had a TON of photos I needed to go through). The Meat Market fit the bill with a decent wine selection and a perfect table for me on the sidewalk. 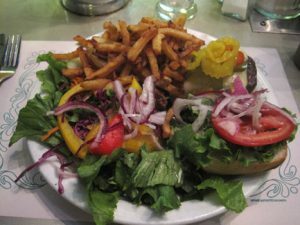 The sweet potato fries I spied on another diners table didn’t hurt either. I decided on the “East Meats West” sandwich as it was a flavor combination I’d never considered: Grilled chicken marinated in cinnamon & orange with harissa mayonnaise. I was so impressed with the combination it sent me on a 2 day hunt for harissa in Dallas. I finally found it at World Foods but Central Market now has it back in stock. Harissa is a North African hot red sauce or paste. Main ingredients are chili peppers (often smoked or dried), garlic, coriander, caraway, or cumin, and usually olive oil. The heat in harissa is not a painful heat…. it’s quite addictive. 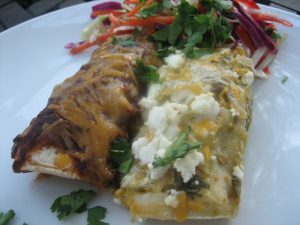 When I recreated this recipe I had a few friends over for a chilly evening on the patio. On the first bite my good friend Rhonda said “At first I thought oooh it’s spicy… and I want more”. It’s good stuff. In a large plastic bag combine marinade ingredients (cinnamon, coriander. orange juice, orange zest, garlic & olive oil). Add chicken and marinade in the refrigerator for 4 hours or overnight. When ready to grill, remove from marinade and salt & pepper chicken. 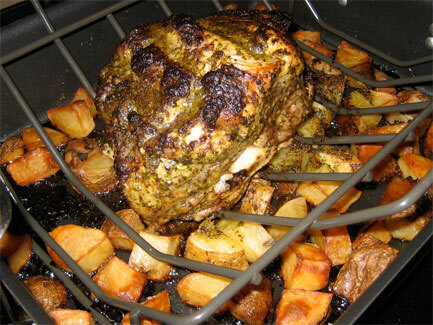 Grill or bake until cooked through and let rest for 10 minutes. Slice into pieces for sandwich. In a medium skillet add cabbage and vinegar and cook on medium until cabbage is wilted but still has a small bite to it. Salt & pepper to taste. For mayo: combine mayo, harissa and lemon juice. Set aside until ready to assemble sandwich. To assemble sandwich spread mayo on both sides. Add a layer of cabbage on the bottom and top with the chicken breasts. 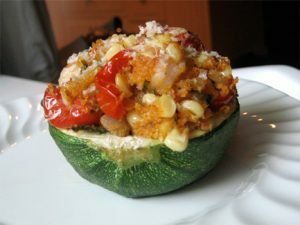 I should have called this “Summer Stuffed Zucchini” as it’s full of sweet summer flavors. I found these cute litte tatuma zucchini at Central Market and thought why not… they remind me of mini pumpkins. You can use regular zucchini as well or anything for that matter. You could stuff a shoe with this filling and find happiness. 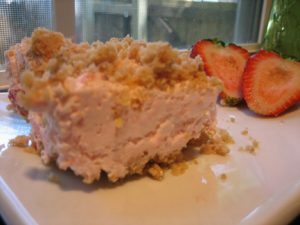 This dessert takes me right back to summer and memories of sneaking into the freezer with a fork. It’s frozen crunchy sweet strawberry goodness. A tantalizing & perfect sweet treat for summer. Enjoy! Combine flour, walnuts, sugar and melted butter in a bowl. Spread onto baking sheet and bake at 350 for 20 minutes. Let cool and break into pieces. Mix all above except cool whip and beat for 10 minutes, until light and fluffy. Fold in cool whip. In a 13×9 pan, spread 2/3 of the crumb mixture in the bottom, top with the fluff filling and top with the remaining 1/3 crumb topping. Freeze 6 hours or overnight. A guy at work says it isn’t fair when Bobby Flay adds pancetta to his dishes on Iron Chef… in fact he says it’s cheating. Everything is better with pancetta. 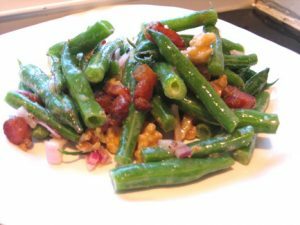 Green beans are so good for you… but gosh they can be boring. I’m not a huge fan of the green bean casserole with the styrofoam onions… and I wasn’t cooking Asian food or I had have gone the stir fry green bean hoison route… so I decided to try this combination. I was really surprised how well this turned out and I couldn’t keep dipping into the bowl for more. I’ll be buying more green beans and preparing this all summer. There is no dairy so it would make a perfect BBQ side dish. Bring a large pot of water to a boil, add green beans and parboil for about 4 minutes. Transfer to a cold water bath and drain. Add to serving bowl. Dice pancetta into small pieces and add to a COLD skillet with a little olive oil. heat the skillet over medium heat and cook pancetta until crispy. Drain on paper towels. In the same pan as the pancetta, toast the walnuts over medium heat until they become fragrant, about 2 minutes, and then transfer them to a small bowl to cool. Add the onion, walnuts and pancetta to the beans and stir to combine. In another small bowl, whisk together the oil, vinegar and mustard. Toss the dressing with the green beans and season with salt and pepper. Serve warm or at room temperature. 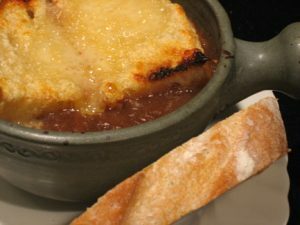 French Onion soup is quite simple to make if you let the food processor do the chopping for you. I’ve made several variations of this soup and this is my best yet. Cooks note: Try serving the soup with an apple & gruyere grilled sandwich in lieu of the bread on top of the soup. Caramelizing the onions. It takes a while but if you aren’t careful 5 pounds of onions could be down the sink in a short amount of time. The first 10 minutes aren’t crucial as it takes a while for the water to cook out of the onions (cover your pot to wilt quicker). Once the onions are sticking to the bottom of the pan you’ve reached the critical stage. You can’t let them burn… it’s about impossible to remove the burned black dots that will linger through your soup. Let them brown and then scrape the bottom of the pan to get all of the bits off and repeat this process for 20 minutes. Eventually those brown bits will stain the onions. Beef Stock. My favorite is Kitchen Basics. It has rich color and tons of flavor and its not costly at only a few dollars for a 1 quart box at Central Market. Sherry and Brandy. The combination is necessary for that aromatic note the soup is famous for having. I’ve made it in the past with only red wine and the depth of flavor is not the same. If you aren’t a brandy drinker and wonder what you will do with the leftovers – save it for Sangria in the summer. Melt 1/2 stick of butter and olive oil in a large dutch oven over medium heat. Add the onions, garlic, bay leaves, thyme, and salt and pepper and cook until the onions are very soft and caramelized, about 35-40 minutes. Add the wine, brandy and sherry, bring to a boil, reduce the heat and simmer until the liquor has evaporated and the onions are dry, about 5-10 minutes. Discard the bay leaves and thyme sprigs. Dust the onions with the flour and give them a stir. Turn the heat down to medium low so the flour doesn’t burn, and cook for 10 minutes to cook out the raw flour taste. Now add the beef broth, bring the soup back to a simmer, and cook for 10 minutes. Season, to taste, with salt and pepper. Thank you Anne Burrell… you are brilliant and I love your food. Steamed mussels have become a favorite of mine. I first had them about 12 years ago at an office party in Ft Lauderdale. They were swimming in butter, wine and parsley – and I loved them…. I was not yet the Foodie I’ve become so it was several years before they came back into my life. They are beautiful little creatures with their glossy black shells and surprisingly very affordable ($5-$6 pound). If serving as the main course I’d suggest a pound per person and lots of bread. Do not skip the spicy aioli… it is what makes this recipe incredible. 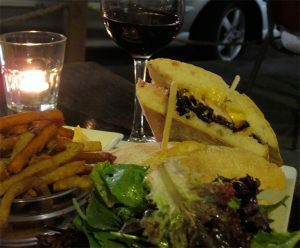 It seeps into the wine and salty sea juices… makes a lovely spicy sauce to dip your bread into. I made a few modifications to the original recipe: I used shallots instead of onion, added parsley and I cut the wine WAY back (recipe calls for an entire bottle). I used Sauvignon Blanc for the wine and there was plenty left for drinking. To make the aioli: Coarsely chop the roasted peppers and place them in the best blender for the money or food processor. Add the yolks, garlic, vinegar, chili paste, and salt to taste. Puree until the mixture is smooth. While the machine is running, slowly drizzle in the oil, until incorporated. 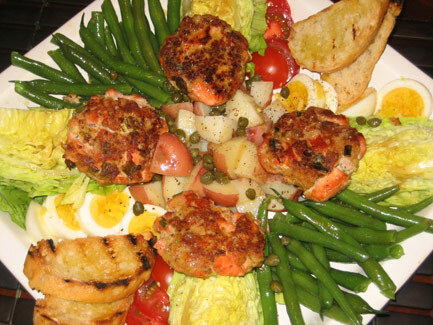 Check the aioli for texture and flavor. If it’s too thick, add a few drops of water to thin it down, or on the flip side if it’s too thin add more oil. The desired outcome is a fairly thin aioli. Check the flavor and add more salt or chili paste, if desired. Refrigerate until ready to use. To cook the mussels: In a pot, large enough to accommodate all the mussels, generously coat with olive oil. Add the shallots and bring to a medium-high heat, stirring frequently. Cook the shallots until they are very soft and aromatic but have no color. Add the garlic, thyme and bay leaf and cook for another 2 to3 minutes. Stir to be sure the garlic doesn’t burn. Add the mussels and stir to coat with the oil. Add the wine and cover the pot. Steam the mussels for 5 to 6 minutes or until all the shells open. If some shells don’t open, cook them for a little longer. Sometimes the freshest mussels are the most stubborn to open. 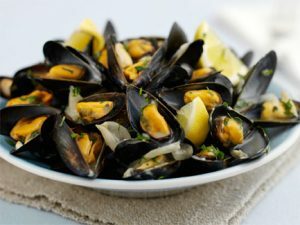 Remove the mussels that don’t open after longer cooking. When in doubt, throw out. Serve the mussels in individual bowls with lots of the juice from the bottom of the pot. Generously drizzle each bowl with the aioli. Serve with lots of crusty bread to soak up the liquid!